I’ve been wanting to to give embroidery a try for a while. I had never embroidered anything before this brooch, except for few half-cross stitch works I made when I was a child. 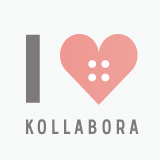 So I looked for embroidery classes last year, but I didn’t find anything I liked in Milan. I didn’t have time and will to start as self-taught. I wanted to learn the basis of embroidery with the help of a teacher at least and understand if it could have been a right hobby for me. In July I finally found a one-day embroidery workshop and, despite my big and growing belly, I decided to get it a try and I signed up. 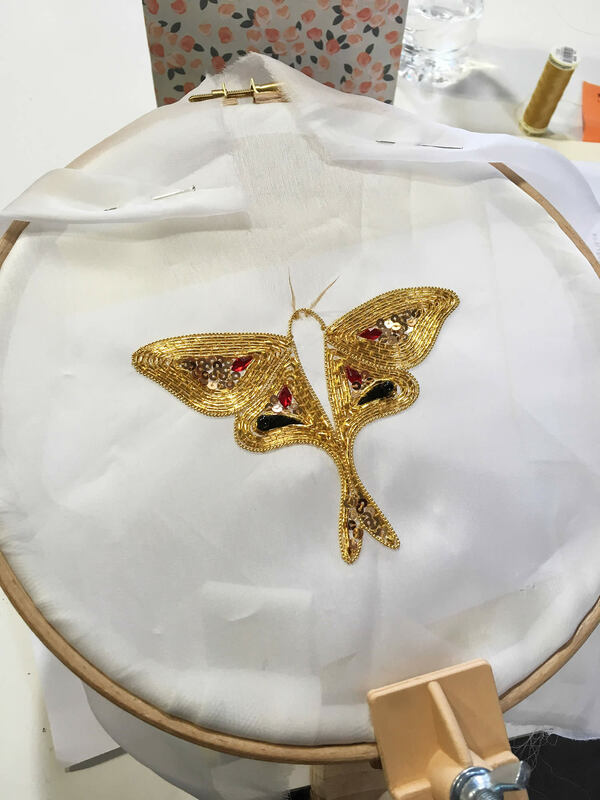 It was a Goldwork Couture Embroidery Workshop held by Jelena – JS Embroideries at Hub Textile in Milan. 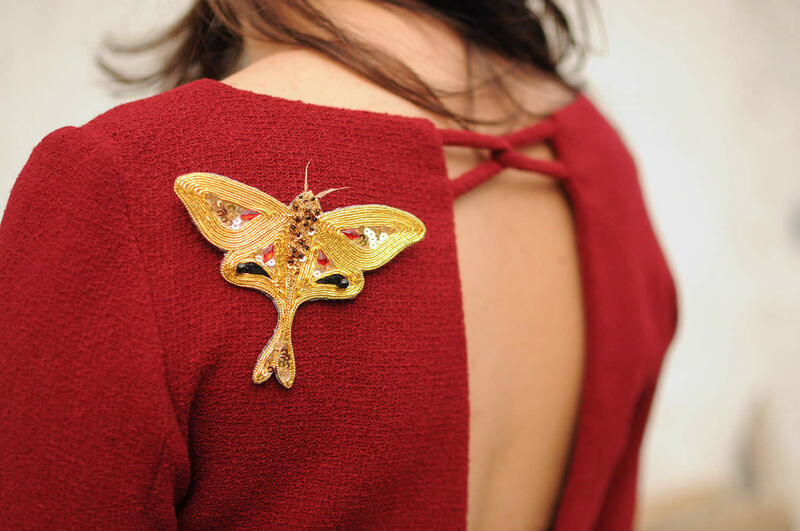 The aim of the one-day workshop was to made a moth brooch with the Goldwork technique. 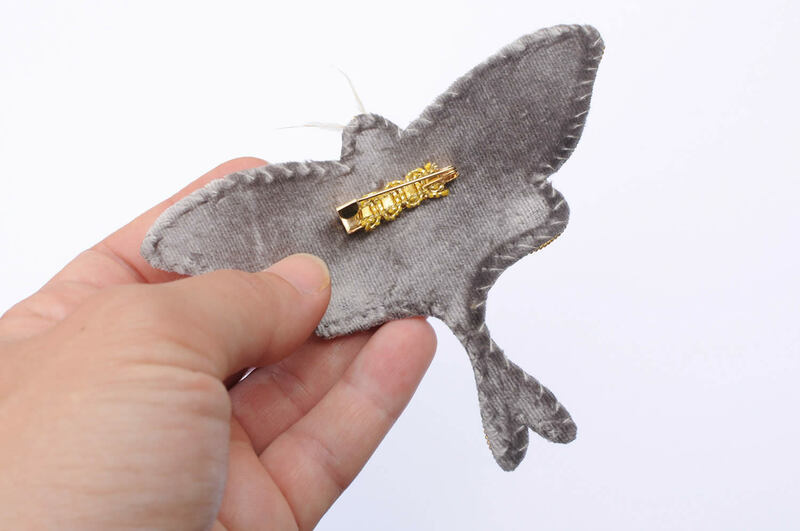 I honestly have to say that I didn’t know this embroidery technique, but I saw the picture of the brooch on Instagram and I thought it was a good and fun challenge! 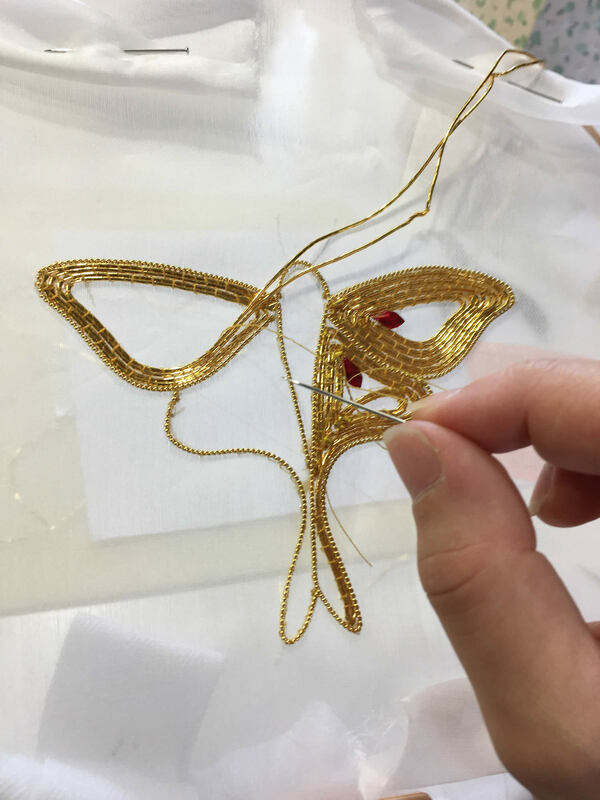 Then I looked for more info about Goldwork and I found out it’s an ancient embroidery technique. It’s been used to make precious decorations with gold threads for years. Here you can find two pictures of my work in detail, I made with the help of Jelena! 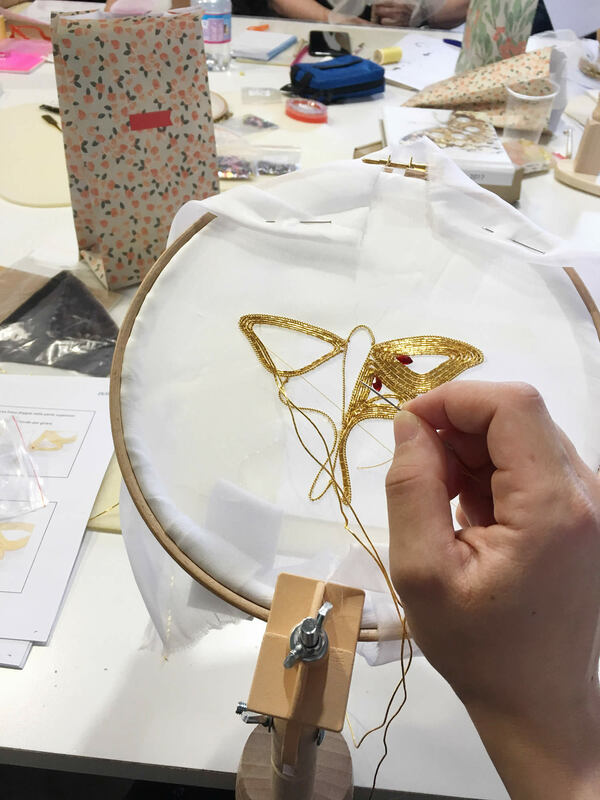 Here are some pictures I took during the workshop, in which you can see some step of the brooch making (I finished the velvet back up at home, thanks to the instructions I was given by the teacher). 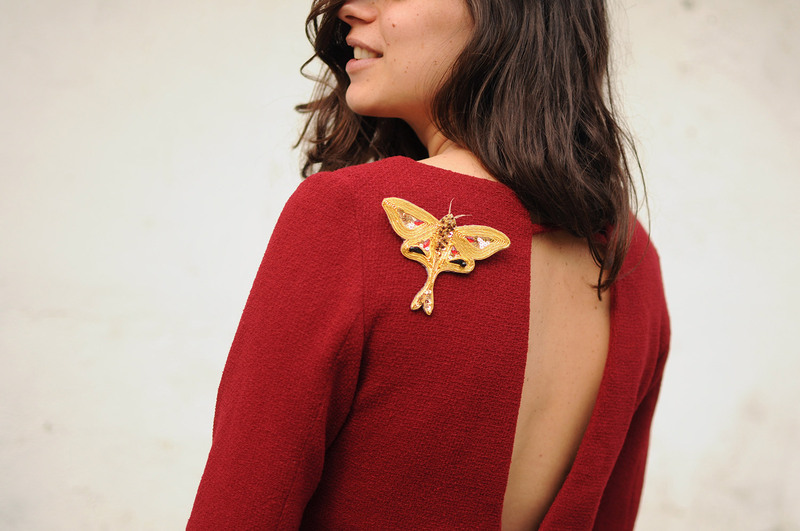 The materials to make the brooch were provided by the teacher during the workshop. The workshop was very fun and I found out I like embroidery very much! It’s relaxing! I’d like to use this technique to decorate some dresses I sew or to make accessories (earrings for instance). Let’s see! 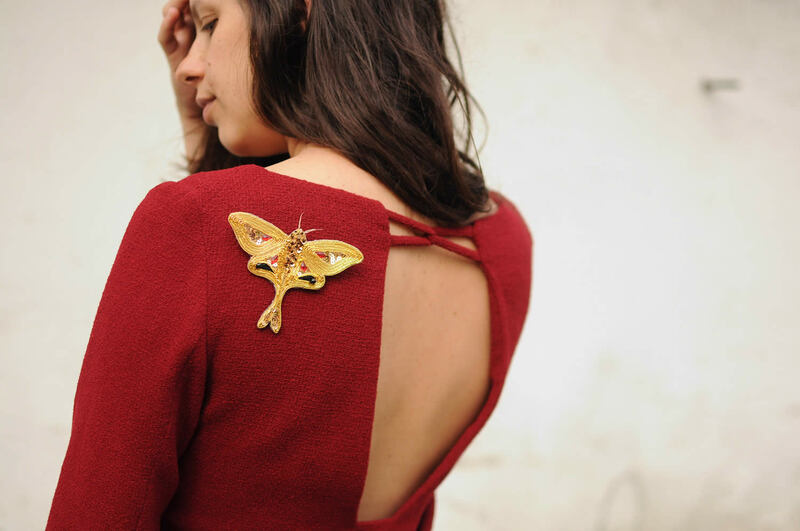 Here I’m wearing the brooch on a red dress in wool crepe I made last year. 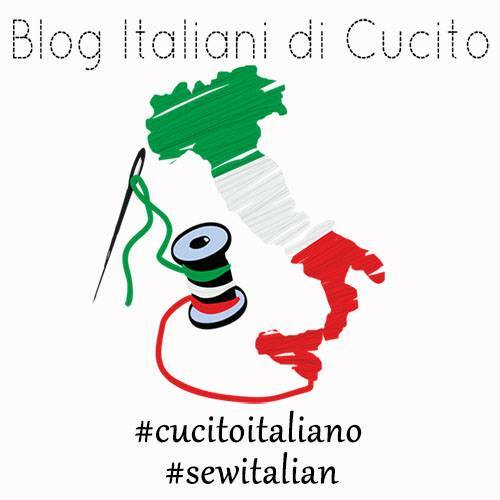 For more info about Jelena couture embroidery workshop in Milan, Rome and Salerno, have a look at her website or Facebook / IG profile. That is really breathtaking. 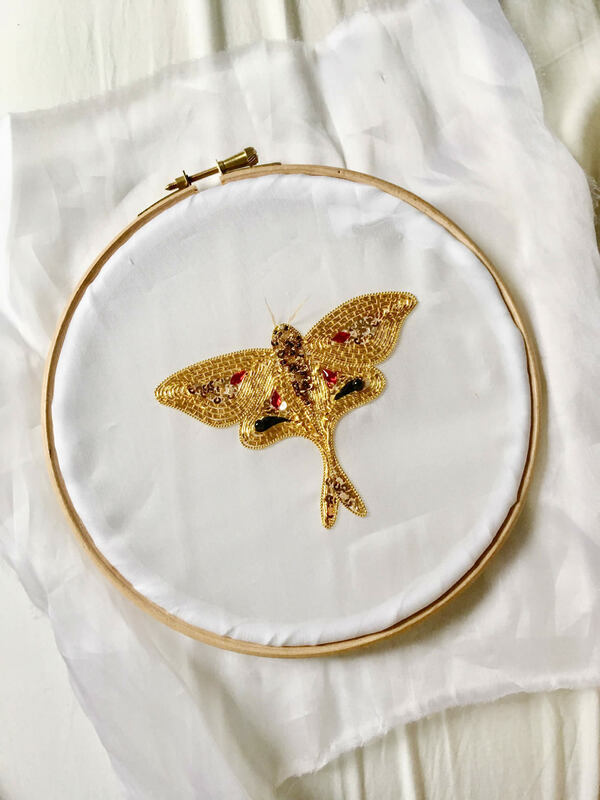 You’ve got me Googling goldwork embroidery! I’ve also never seen a brooch worn on a statement back like that, very original! Thank you so much Lia <3 and sorry for my late response! Thank you so much Beth! 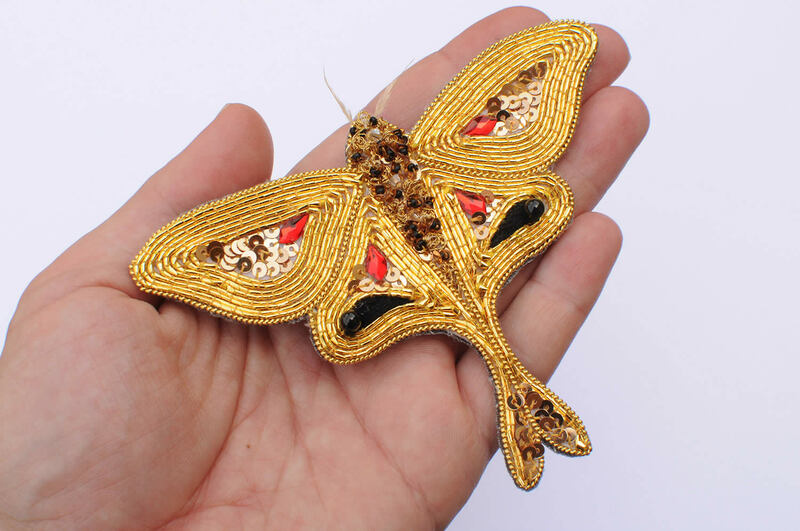 You should try Goldwork embroidery…it’s very fun and the final result is stunning!